SACRAMENTO, Calif. — It appears that Vlade Divac does get his man after all. 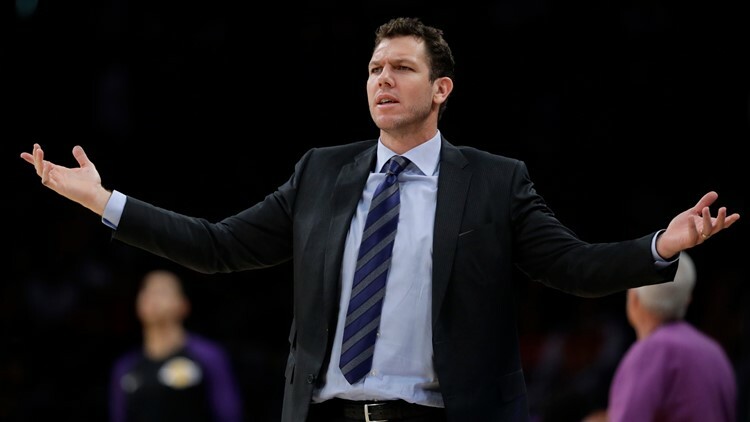 League sources tell ABC10 that the Kings will hire former Lakers coach Luke Walton to be their next coach and that an announcement could come by the end of the weekend. Divac inked his own contract extension to continue as the Kings' general manager last Thursday, the same day he dismissed Dave Joerger after three seasons in Sacramento. The next morning, Divac reached out to Walton almost immediately after he parted ways with the Lakers, to discuss the Kings head coaching vacancy, sources say. Those sources spoke to ABC10 on the condition of anonymity because they were not authorized to speak publicly. Unlike in 2016, where the Kings coaching search lasted almost a month before Sacramento hired Joerger to replace George Karl, Divac will move swiftly to land Walton. Walton was the top target that Divac wanted in Sacramento, according to sources, but he wanted to go to familiar territory. Joerger was let go by Memphis after Walton signed with Los Angeles and then quickly landed with Sacramento. The 39-year-old, and son of Hall of Famer Bill Walton, played nine of his 11 seasons with the Lakers, where he won two NBA titles. Coaching a young Lakers team seemed like the perfect place for him to be as a first-time head coach, following his two seasons with the Warriors, where he won a championship alongside head coach Steve Kerr. Walton would assume the role of fill-in coach for Kerr during the 2015-16 season while Kerr recovered from back surgery. He led a star-studded Golden State team to a 39-4 record while filling in for the ailing coach. Walton took over a young, rebuilding Lakers team in 2016, but this past season things got rocky. In his three seasons as Lakers coach, Walton finished with a 98-148 record and never reached the postseason. Walton and his Lakers team found themselves in the center of the national spotlight after signing LeBron James as a free agent last summer. But his final season with Los Angeles had as much drama surrounding the team and played out with storylines fit for Hollywood. The Lakers finished this season with a 37-45 record, a two win improvement over the previous year as one of the NBA’s youngest teams with young stars like Brandon Ingram, Kyle Kuzma and Lonzo Ball. Many of those young pieces remained after James brought his talents to Tinseltown, but the team also added many veteran pieces such as Rajon Rondo, JaVale McGee and Lance Stephenson for a potential playoff push. James would be plagued by a groin injury throughout the season, causing him to appear in a career-low 55 games. Other starters missed significant time with injury too. Ball played in only 47 games after suffering a sprained ankle in January. Ingram appeared in 52 games, as his season ended in March when he had surgery to remove a blood clot. A finger injury even caused Rondo to be sidelined for 36 contests. After missing the playoffs for their sixth consecutive season, Magic Johnson unexpectedly stepped-down as the Lakers’ president of basketball operations in front of reporters at an impromptu press conference, opting to announce his decision in front of the cameras rather than first notify team ownership. He and Walton clashed just six games into the season, as Johnson was disappointed with the team’s sluggish start, according to the L.A. Times. Certainly, Walton isn’t to blame for all of the Lakers misfortunes over the past season, but the Kings will have to hope that the drama stays in L.A.
On Friday, as his Warriors were preparing for their opening round playoff series with the Clippers, Kerr had high praise for his former assistant coach and he weighed in on Walton parting ways with the Lakers. Divac’s interest in Walton could have to do with his desire to continue to play an uptempo style and having the familiarity of his character as both were teammates for the 2004-05 Lakers season. Divac will need to have the utmost confidence that Walton can relate, communicate, build chemistry and lead a primarily young Sacramento team, consisting of core players De’Aaron Fox, Buddy Hield, Marvin Bagley III and Harry Giles. Walton will become the 10th coach since Rick Adelman - the last coach to lead Sacramento to the playoffs back in 2006. He'll inherit a Kings team that is on the upswing after winning 39 games this season under Joerger. Sacramento still fell short of the postseason, going 11-17 after the trade deadline, missing the playoffs for the 13th straight season. Watch below, Friday's edition of "Purple Talk" Lina Washington and Sean Cunningham discuss the firing of Dave Joerger and Luke Walton being a potential candidate.